Whenever there is a conversation about the most prodigious football players of all time, the name of Johan Cruyff is sure to come up. The legendary Dutchman was perhaps best known as the on-field conductor of the "Total Football" philosophy, which took the football world by storm in the early 70s. In addition to that, he won the Ballon d'Or three times and was voted European Player of the Century by the IFFHS in 1999. 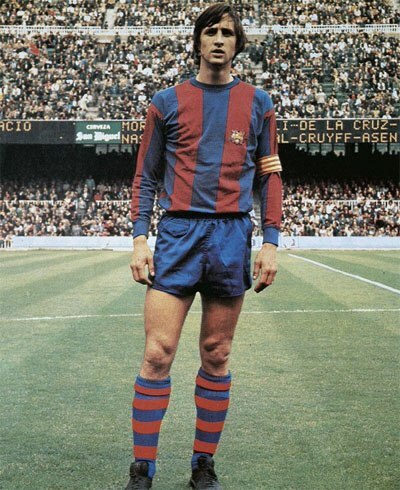 Cruyff posing in the Barca kit. A short bio of Johan Cruyff (his last name is sometimes written Cruijff) will tell that he was born as Hendrik Johannes 25 April 1947 in Amsterdam. He grow up in a working-class family only minutes away from the Ajax's football stadium. 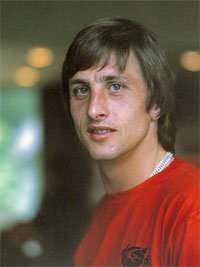 Johan Cruyff made his first football steps in AFC Ajax, where he played for the youth squads before being moved to the first team in 1964. He became a regular in the starting eleven around the same time Rinus Michels, a renowned Dutch player-turned-coach, arrived at the club. Michels soon started employing his own brand of football philosophy called Total Football; in essence, this tactic allows any outfield player to take over the role of his teammates. This unique philosophy was groundbreaking for its time, and no player has ever embodied it better than Johan Cruyff. Though nominally a centre forward, Cruyff was everywhere on the pitch, switching to different roles whenever his team needed it. Of course, Total Football quickly proved to be a complete success. During his nine seasons at the club, Cruyff led Ajax to six Eredivisie titles, four KNVB Cups and three European Cups. In the process, he played 240 games and scored 190 goals; for his achievements, he was awarded the Ballon d'Or twice, in 1971 and 1973. At the start of the 1973/74 season, Cruyff joined his former coach and mentor Michels in Barcelona for a record-breaking $2 million deal. It didn't take long to notice that Cruyff and Barcelona were a match made in heaven; in his first season with the club, Cruyff led the team to their first La Liga title since 1960, routing their fiercest rivals Real Madrid 5-0 along the way. Due to the dominating nature of his performances, Cruyff won his third Ballon d'Or at the end of the 1973/74 season. 1974 was also the year of the World Cup, the first and only World Cup Cruyff would participate in. With Michels at the helm, the Netherlands were also playing Total Football, which gave Cruyff plenty of space to thrive. And that's exactly what he did; under his on-field leadership, the Netherlands cruised to the finals, not conceding a single goal in the process. 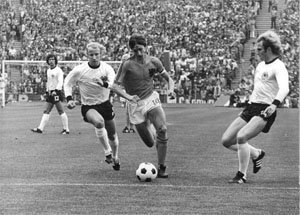 Their run came to an end in the finals, however, as West Germany overcame Netherlands first-minute lead and eventually won the game 2-1. Cruyff was still awarded the Golden Ball for his performance in the finals. The Dutch was a star and for sport fans of today it may be strange to see pictures of Cruyff smoking, which was not an unusual sight – Johan Cruyff was both one of the greatest footballers on the planet and a big smoker. After leaving Barcelona in 1978, Cruyff decided to go on a North American tourney, playing two seasons for the Los Angeles Aztecs and the Washington Diplomats. After his short spell in Levante, where he played only 10 games due to a series of injuries, he returned to Ajax in 1981. Once again, he led them to two Eredivisie titles in 1982 and 1983; however, after Ajax didn't offer him a new contract, Cruyff decided to finish his playing career in Feyenoord, Ajax's long-time rivals. He was successful there as well, leading Feyenoord to their first Eredivisie title in ten years. After ending his playing career, Cruyff proved himself a capable manager. Ajax and Barcelona still maintain his football philosophy, and the list of players and managers directly or indirectly influenced by him is too long to count. Not many would argue that Cruyff's legacy, both on the field and off it, makes him one of the most important men in the history of football. Besides being manager and a great football profile, the Dutch did also take the chance to establish his own sportswear label: Cruyff trainers. The 24 March 2016 came the sad news that Johan Cruyff had died, 68 years old. The bellowed footballer died after being diagnosed with lung cancer in 1991.